Jonathan Portes gave an accomplished performance, asserting that immigration has boosted society, and that it hasn’t depressed wages. Such thinking may be lapped up by a forum of intelligentsia, but try telling that to my landscape gardener friend, who has been severely undercut by waves of east Europeans. 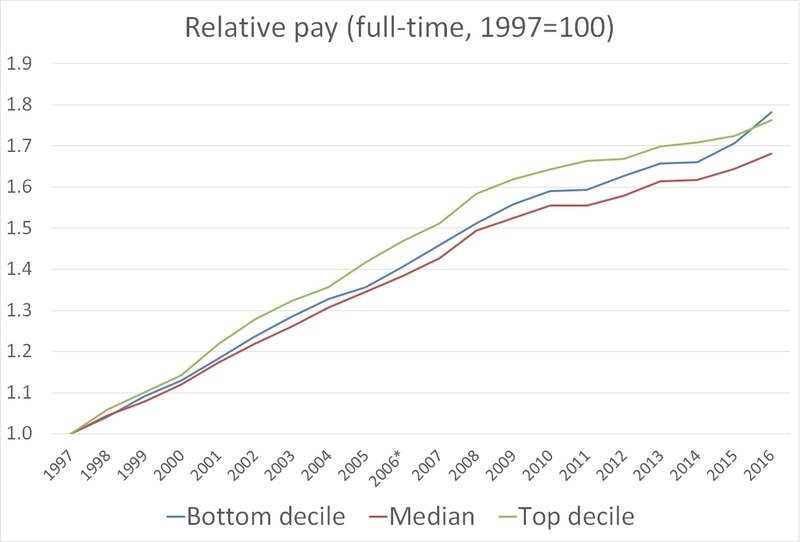 In recent years the falling relative pay for basic jobs, the overwhelming stress on mobility and educational stress, the hourglass labour market and the apartheid system created by a mass higher education system have all made it harder for the mainly Somewhere people doing routine jobs to feel valued and dignified in the modern economy. Now I would argue that this point – that workers at the lower end of the earnings distribution have done particularly badly - is pretty fundamental to the entire argument Mr Goodhart is making (indeed, the importance of this paragraph to Mr Goodhart’s thesis is presumably why Mr Bentley highlighted it). So you might think that getting it wrong matters rather a lot. But I have no doubt what Mr Goodhart’s response will be. As with my review of his earlier book, “The British Dream”, which listed (very much non-exhaustively) a number of his more glaring factual errors, he wouldsay that I am “sniping in the footnotes” and that I spend too much time with databases and not enough in the “real world”. But there is a fundamental problem with the argument by those like Dr McCrae or Mr Goodhart that “spreadsheets” or “databases” are somehow divorced from reality, while the experiences of (selected) individuals represents it. In fact, spreadsheets – or at least the ones used by labour market economists and, indeed, quantitative social scientists more broadly, are far more closely connected to the “real world” than any individuals’ experience can hope to be. Consider the Labour Force Survey (LFS), the primary data source for economists analysing the UK labour market. Each quarter the LFS samples 40,000 households, covering 100,000 individuals, a representative sample of (broadly) the UK resident population; lengthy interviews are conducted in person (and subsequently by phone) and cover a wide range of topics in considerable detail, from education, earnings and employment to age, marital and family status, country of birth, and disability. So when I say that the evidence is clear that immigration doesn’t impact on the employment of UK-born residents, this analysis is formulated in terms of numbers on a spreadsheet or data points in a regression. But behind those numbers are what tens of thousands of real people have told professional interviewers, and in a way which means that the results are in turn representative of lived experience of the UK population as a whole. 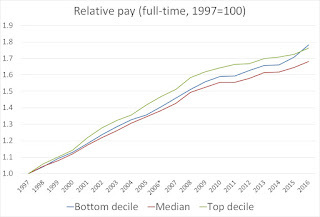 So the statement that, say, the bottom decile of full-time workers have recently seen their pay rise faster than average is not (just) a statement about numbers, or a claim that Mr Goodhart has failed to read the right ONS spreadsheet. It is a statement about what has – contrary to Mr Goodhart’s claim - actually happened to the pay packets of several million people. It is the spreadsheet, not what my nephew looking for a job, your cab driver, or Dr McCrae’s landscape gardener friend say that best reflect the real world. Someone who is nudged just above this threshold, with an extra £10 a week, is deemed to be “lifted out of poverty”, although the people concerned would be astounded to hear themselves so described. If they had a family, then their children would be described as being “lifted out of poverty”. So, by precision-bombing the right people with tax credits, you could claim to have lifted hundreds of thousands of children out of poverty.,, instead of fighting poverty, the Labour government spent billions manipulating a spreadsheet – to catastrophic effect. In other words, despite Mr Nelson’s rather convenient assumption, the spreadsheet-driven policy – by ensuring that low-income parents had enough money to look after their children - worked in the real world. None of this means that talking to people – or, more relevantly for these topics, rigorous qualitative research, which is generally not what the critics mean – is not useful and sometimes necessary to get a full picture. But suggesting that data doesn’t represent reality as well as personal experience is simply the opposite of the truth. If you want to know what’s actually going on in the real world, look at the data.